The Nets went into last night’s contest losers of four straight. After a big loss against the Blazers on Sunday they looked to get a win to end this current streak. The Celtics, a usually solid defensive team, were looking to regain some of their prowess on the defensive end. They have great guard play with Isaiah Thomas and Avery Bradley and they have now had Al Horford (concussion protocol) back for three games. Both teams have had ups and downs to begin the season. After a tough loss to the Warriors the Celtics had some quality wins against the Pistons and Timberwolves. The Nets have been without Jeremy Lin since November 2nd and the offense has been somewhat stagnant since. Brook Lopez has continued to lead the team offensively. Brook Lopez got off to a slow start for the home team. However Trevor Booker paced the Nets early with 7-points, shooting 3-4 in the first quarter. The Nets as a team shot poorly in the first, going 27.3% from the field and 25% from behind the arc. The Nets regained their composure in the second period and really started to put together some productive offensive possessions and more importantly they started to play consistent defense against the Celtics. The Nets forced the Celtics into taking deep perimeter shots and played better defensively as the only allowed 21-points and forced eight turnovers. 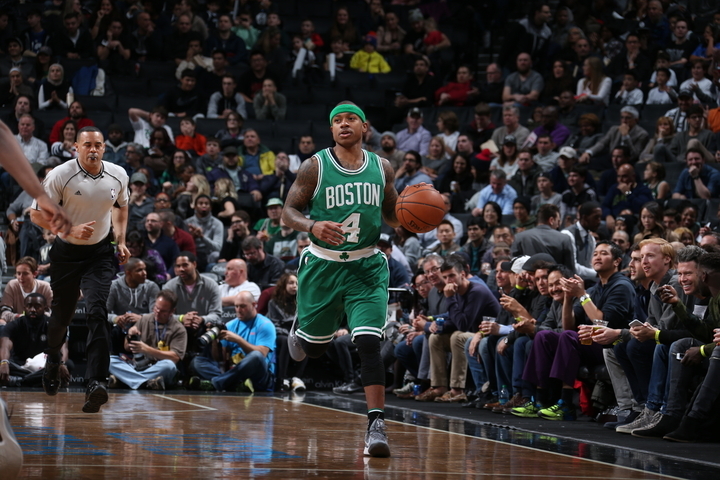 At the half the Nets trailed 51-49. The game got a little chippy to begin the third as Marcus Smart and Trevor Booker got together to discuss thanksgiving plans on the court. (Im joking of course). The fiery Smart and Booker had to be separated by officials and teammates and received technical fouls. This seemed to ignite the Nets as they went on a run to cut the lead to 8 with 8:05 left in the period. Guard play was very important in this game for both teams. The Celtics’ Avery Bradley and Isaiah Thomas combined for 45-points in this game while the Nets starting guards tallied 18-points. Isaiah Whitehead had 4-points with 3 assists as he continues to learn the point guard position on the professional level. The third quarter was where the Celtics really pulled away. They went up by 12-points with just over 2:46 left in the period. The Nets continued to chip away at the lead but they could never get close after that point. Sean Kilpatrick finished the game with 23-points on 8-17 shooting and Joe Harris added 12-points off the bench. Brook shot 4-14 from the floor and went 1-6 from behind the arc. Again Brook has the ability to expand his game from behind the arc however he plays best when he is aggressive in the paint. That’s where he can really help his team. The Celtics hit 15 threes in this game and shot 39.5% from behind the arc. Thomas hit five while Al Horford and Jae Crowder hit three each. The Celtics also went to the line eight times which speaks to their proficiency from the perimeter last night. The Nets will look to rebound from this loss when they face the Indiana Pacers this Friday while the Celtics will host the San Antonio Spurs.